As you know, trying out new mascaras is my hobby. I am literally obsessed with seeing what's new in the mascara world and always have lots of them on the go at any one time. I can usually tell if I'm going to love something or not after the first application and this mascara was no different. The Rocket Volum' Express mascara from Maybelline has the cutest packaging. I'm all about bright colours in terms of packaging as I'm usually rooting around my make up bag in a hurry and this stands out. The wand is one of the thick ones with teeny plastic bristles that comb through the lashes and help separate them. I like to get right into the roots of my lashes and the bristles tickle a bit and we know that a big wand with lots of bristles means you can do one eye with one dip of the wand. No need to go back and double dip. Formulation wise, it's on the thicker side which means volume. Usually for me, if I'm using a mascara that has a thin formula, I'll get length over volume but I personally prefer more volume over length. So how did I get on? I think I'll let the before and after photos speak for themselves! I knew after doing one eye that me and The Rocket were going to be best friends. 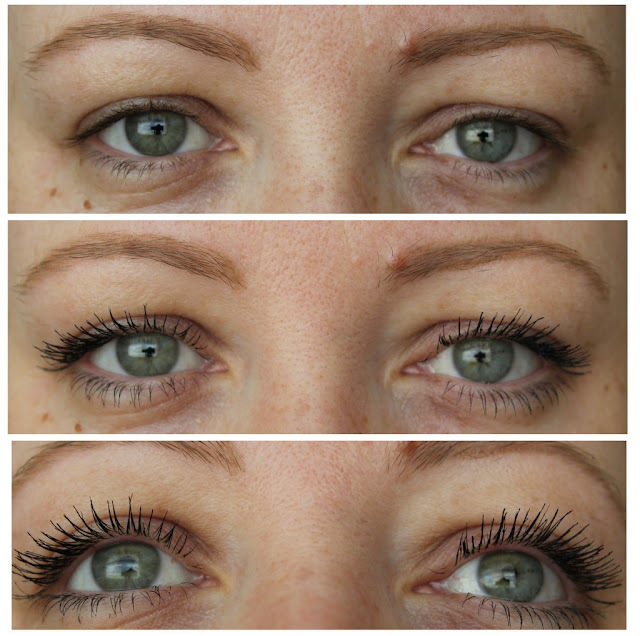 As you can see in the photos, I get lots of lift in the eyelashes along with length and volume. While each lash isn't separated, they're not clumped together either and that's because of the wand and bristles. They comb through my lashes while depositing lots of the formula, giving me gorgeously volumised lashes! When I'm working with mascaras, I focus on the outer lashes as I love them to be long and thick and you can see that with one coat of The Rocket, I get lots of thickness on my beloved outer lashes. Combined with the fact that it stays put all day, has no flaking and comes off easily with eye make up remover, this all makes for a happy, volumised lash Karen. This was sent to me but I was going to buy it any way to try it out and at €11.99, it's definitely worth checking out if you want your lashes to look like mine! Love. It. Yep, yep, YEP! Gorgeous on you dude. I made the schoolboy error of giving my sample to D'Sis in a bag of goodies once I'd photographed it, I had to repurchase last week on Boots 3 for 2 because I missed it so much. Wow....your eyes look amazing with this mascara. On to the list it goes!! Looks great on you, but no wand innuendo? I was debating buying this mascara the other night but decided against it. Now seeing it on you I can tell that I made the wrong decision. It looks absolutely lovely! Oh this looks bloody brilliant, I think I need it! I'm gonna replace my usual Covergirl mascara with this one as soon as it dries out for sure ! It makes a great effect on you ! and for a price like this ! wow, your eyes look amazing with this mascara! Is this really just one coat? Amazing!